What is Energy Efficiency and how is it different from Energy Conservation? While interacting with people we get these statements quite frequently: “Bijli Bachao! So you tell people to use less electricity and conserve it?” or “Your website has ideas on how to buy appliances, how does that relate to saving electricity?” The easiest way to save energy (or electricity) is to use less of it, but we have to be realistic in our approach. Our lifestyles are changing, and with increased pace of development, our need for appliances is increasing and so is our need for energy. Thus the ideal mix to save energy will involve both conservation and efficiency. Now let us look at what is the difference between the two. Whenever you use less of something that means that you are trying to conserve it. So if you use a bicycle instead of a motor vehicle, it means that you are trying to conserve fuel (among many other reasons why you would prefer to use bicycle over a motor vehicle). If you switch off lights when they are not needed, then you are conserving energy. When you increase the temperature at which you operate your air conditioner from say, 24 degrees to 25 degrees, you are conserving energy. You also conserve energy when you switch off your DTH boxes and TVs when they are not in use. Energy Conservation is all about using energy only when it is required and using it as much as needed for the job and not wasting any amount of it. It requires a conscious effort from the user of energy to make sure that there is no wastage on a regular basis. It requires a lot of behavioral change and needs effort. It may not need any investment always. Energy efficiency in contrast means using lesser energy to do the same job. When you buy a car that gives more mileage, you use less fuel to travel the same distance. When you buy a 5 star rated air conditioner instead of a 3 or 2 star rated air conditioner, it means that for the same usage and in same conditions, you use less electricity (for the same temperature at which you operate them). If you use a 5 star rated air conditioner at higher temperature, you double the effect and combine energy efficiency with energy conservation. Energy efficiency has more impact on your personal finances. An efficient appliance may cost more than an inefficient appliance. Although the additional capital cost may get recovered in form of electricity savings. Energy efficiency may not require physical effort but requires change in people’s buying patterns. It requires knowledge of various products and their efficiencies. If people start buying more of efficient products, manufacturers will start producing more of them. 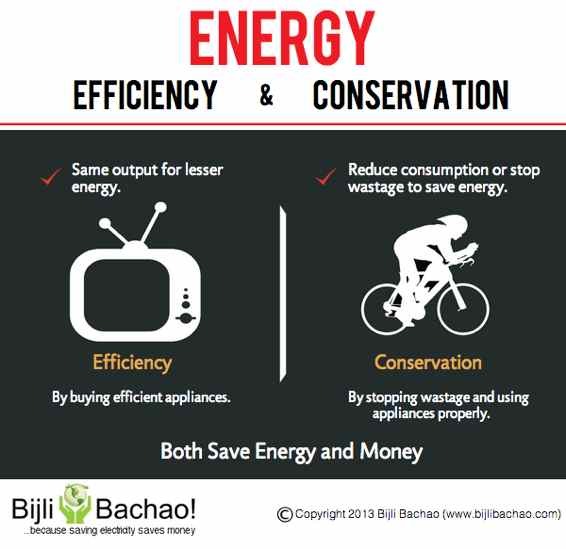 Both energy efficiency and energy conservation have the same goal: to save energy and the same impact: saves money. Both can individually save energy but when coupled together can save double the amount of energy and money. It depends on your choices as to which one you like to do. A good mix of the two can ensure high savings with low investments and efforts.